Word is coming out today that Jack Kaiser, the owner of the much-discussed Huebsch Building perched above the Eau Claire River at the corner of Dewey and Galloway Streets, has decided to halt the renovation of the structure. Plans had included a number of apartments above a restaurant/bar space with a deck overlooking the river, but now the property’s future is uncertain. “The more we progressed, the more issues we found with the building, and the costs escalated beyond a point that the renovation was just not economically feasible,” said Kaiser. “You can only get so much blood out of a turnip!” he added. 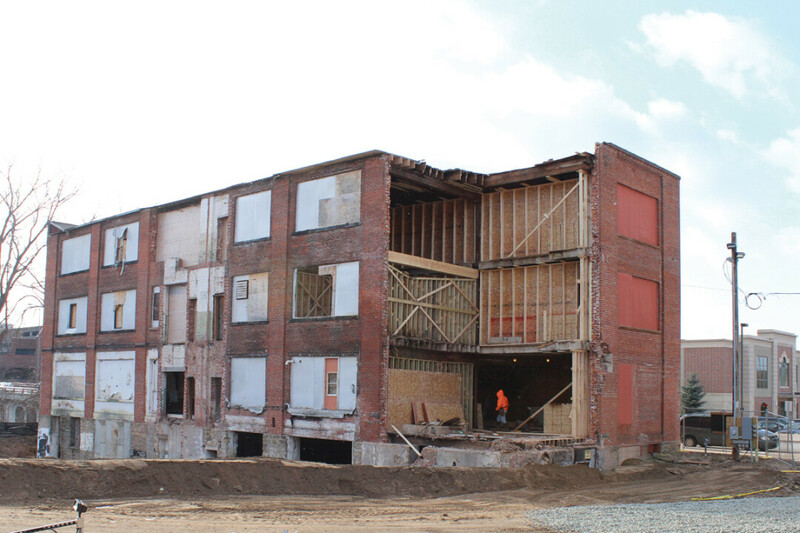 Over the last couple of weeks workers could be seen tearing open the Northeast corner of all three levels of the building revealing some plain-to-see structural issues and challenges. While the next course of action is not fully set, Kaiser said it’s likely the building will be torn down and the lot will be sold, which is bordered on the North side by the Chippewa River Trail. “Over the years there’s been much interest in the lot for residential development,” he said. Kaiser noted that type of work isn’t something his company – Cigan Properties – does a lot of, so they’re likely to let someone else pursue that type of development. Cigan Properties manages a number of commercial properties in the area, including Banbury Place, the Chamber of Commerce Building, and more. A residential component is likely a good move considering the quick rate at which any new apartment in the downtown area is filled, but national and local trends point toward mixed-use properties as the way to go for a thriving city center. Public opinion regarding the project thus far heralded the inclusion of the riverside restaurant, an often asked-for amenity for downtown Eau Claire, so it’s likely the broader community will advocate for a solution that, in addition to apartments, includes a more public component that can be enjoyed by locals and visitors alike.